Are you Looking to save thousands on your next home purchase? Look No further, this home qualifies for a NO CLOSING COST LOAN. 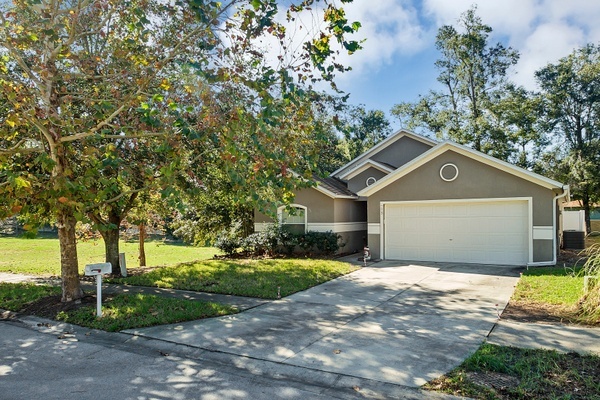 Here is you opportunity to own this move in ready POURED CONCRETE structure home with 4 bed/ 2 bath, 2- car garage located on a quiet street with only one neighbor. Featuring an open floor plan concept, high ceilings with a dining and living room combo ideal of entertaining and gathering with family. Kitchen over look the living room and offers stainless steel appliances, closet pantry and ample counter space. The master bath features walk in closet, dual sinks, garden bath tub and tiled shower. The other three bedrooms are generously sized and share a nicely appointed bathroom. The backyard is fully fenced and large enough to create you own oasis. Near by you have a maintained park to include a space for out door activities, picnics as well as a playground area and dog park. Conveniently located to the Blue Springs State Park filled with manatees, perfect setting for the outdoor enthusiast! Easy access to major roads including I-4 and 17-92 with variety of shops dining and much more! Schedule your private showing today!